Let’s see how the apprenticeship method of teaching can be applied to goal setting. Make a living creating flower vases. While this is a good start, we really don’t have much information about the process. 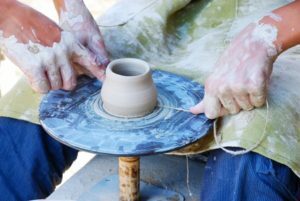 How long should it take to make a vase? How big should it be? Let’s refine the process and make it more specific by using. . .
One of the most popular goal setting techniques is known as SMART Goals. It includes five tenets. . . 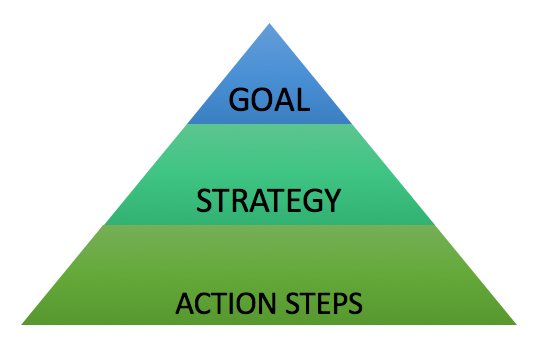 If we apply the SMART Goals framework to our basic goal above , we come up with. . .
Make a living creating twelve inch flower vases with multicolored finishes, that will hold three flowers. I will be able to create one in fifteen minutes and it will sell for ten dollars and result in a five dollar profit. I’ll make $20/hour. As you can see, this is a much better goal. We’ve added specifications. We know how big it will be (specific size), how long it will take to create (measurable and timely) and how much we will make from each one (measurable, achievable and realistic). Now we can visualize our goal much better. We know what the vase will look like and the specifications. Yet we are lacking two things to make the process complete. We have a clear goal, but we lack a strategy/structure and action plan to get to completion. In my experience, setting SMART Goals is not enough. While we can now see the outcome we want clearly, our goal setting plan will stop dead in its tracks if we don’t have a strategy for completion and action steps to get us there. Basically, we can see the vase, but we don’t know how to make it and we don’t have an action plan to make money in the process. He has shown us the goal and made it SMART by giving us the specifications. However, we are no closer to our goal of making money until he shows us how to make one and guides us through the process, hands-on. I’ve been a consultant and software trainer for the last few years and I’ve learned a LOT from my students about goal setting along the way. As a trainer, I know that the tell me, show me, and involve me strategy is very effective. My goal in my classes is to teach students how to use our new web based software. I usually work in a computer lab where the students have a demo copy of our software on their machines and I teach from a projector screen at the front. I have them watch as I show each exercise, and then I have them log in and I lead them through a software exercise themselves. From experience, some students are able to follow along with just verbal instructions, but most need visual help. They need to be able to see the screens to be able to discern the instructions I have given. However, everyone benefits from the hands-on section. I can see the light bulbs go off over their heads as they work through actual day to day routines on their computers. This is where the questions come and where people get stuck. My goal as a trainer is a success if I can teach everyone how the software works, and they are able to go back to their desks and do their daily tasks. If people get stuck in the training, I need to make sure that I can help them get over the hurdle. Many times, if a student gets stuck, they will not be able to learn the rest of the exercise because they are held up behind one stopping point. This is why most goals fail. If you get stuck on one item it may stop you cold. If you don’t have a way to get past the hurdle, the goal fails. We can visualize a complete goal setting plan this way. The top third is the visual goal. We need to see a picture of the finished project and specifications on how it is made. SMART Goals will usually complete this step. This is the Tell Me What It Looks Like. The middle of the graph is the strategy and structure area. We need to make sure our goals are structured for success and that we have a strategy to complete them. This is where it’s nice to work with someone who has gone ahead of us. Someone who has completed the goal before and can give us feedback on a workable structure and/or strategy. Working with an expert in the area will allow us to watch them as they tell us what it takes for success. This is the Show Me How. The bottom section is where we take action. We go hands on and actually work on the goal. This is where you Get Involved Hands-On With the Project. Having a coach or mentor through the process may be critical to success. This is where most goals fail. If the structure is sound but you haven’t gone through the actual steps before, you may be stopped cold in your tracks. Without the external help of a mentor, coach, or team member, the goal will not be completed. Many times we try to complete goals ourselves that really require a team. In my research and experience on goal setting basics, I can tell you this. All three of these items, Goal, Strategy, and Action, need to be present and in alignment. Leave one out and you’re almost sure to find failure. That’s why SMART Goals are not enough. We need a more complete goal system that covers all the bases. In our next post we’ll look at how to create a goal setting system for success. Have you created SMART Goals before? Were they successful?